Over the past 27 years, the Federal Reserve has raised it key rate, the Federal Funds Rate, 35 times, each to slow down inflationary pressures and to curtail elevating price levels. 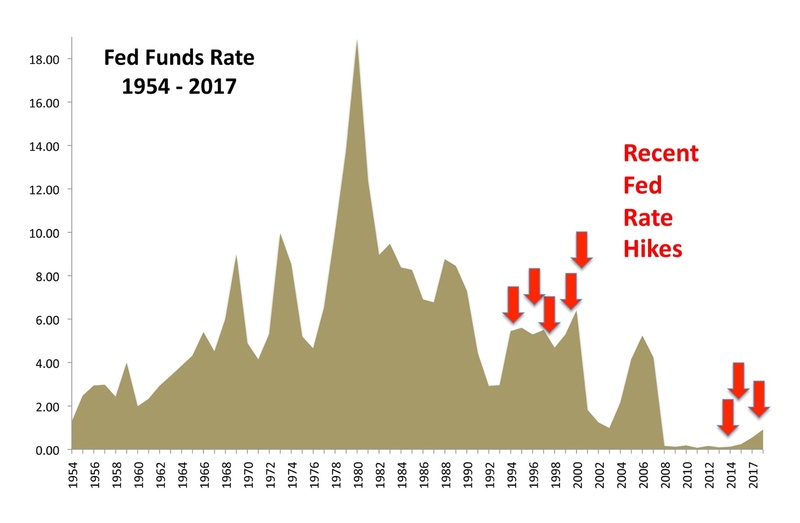 The Fed increased rates aggressively and consistently in 1994 to hold off a rapidly expanding economy, lifting rates six times for the year. A decade later, the Fed raised 8 times in 2005 in order to temper a rapidly expanding housing market where easy mortgage lending had essentially gone out of control. The Fed’s most recent rate increases this year, in March and June, are the first since December 2016. The Fed also raised in December 2015. The level of the Federal Funds rate is much lower now than it had been during previous increases, with the Fed Funds rate reaching a target of 1.00-1.25%. The Fed Fund target levels reached 4.25 in December 2005, with the target rate reaching 6% in February 1995 following six increases in 1994. The item at question during these recent rate hikes is where inflation actually is today. The Fed has an inflation target of 2%, meaning that it wants to see inflation growth at 2%, which translates into some economic growth. The concern among analysts and economists is the fact that current inflation, as measured by the Consumer Price Index (CPI), is running closer to 1.8%, as reported by the Bureau of Labor Statistics (BLS). Some believe that if the Fed tightens too much too soon, then the rate increases could create recessionary pressures, opposite of the Fed’s intent. The CPI during the Fed increases in 2005 was 3.4% and in 1994 was 2.6%. Some economists and entities, such as the IMF, believe that deflation, not inflation may become an issue again. Over the past twelve months, the core CPI index has actually fallen, from 1.9% to 1.7%, still below the Fed’s 2.0% inflation target. Deflationary factors are becoming more apparent throughout the economy in sectors such as finance, education, health care, and now food services and groceries.